We’ve all seen them: big signs on the beach that warn not to step or walk onto the dunes. But why? 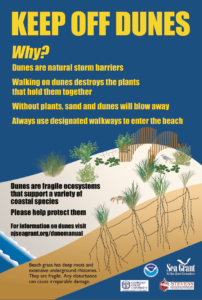 This Keep Off Dunes sign, available from New Jersey Sea Grant Consortium, seeks to go further than just warn the public to keep off the dunes by explaining the many important benefits of dunes. While they play an important role in stabilizing beaches and protecting our homes and infrastructure, dunes provide an essential habitat for many plants and animals. Walking on dunes can destroy the plants that hold them together. Without these plants, wind would erode the sand off the dune, diminishing its effectiveness as a natural barrier. This is why it is so important to stay off the dunes and always use designated dune walkways. So now if you tell someone they should keep off the dunes, you’ll be empowered to explain why. New Jersey Sea Grant Consortium also offers a Dune Manual. The Dune Manual answers a variety of questions and provides valuable resources for community groups or towns looking to build or restore the dunes along the beaches in your area. Municipal officials interested in obtaining these signs can contact the New Jersey Sea Grant Consortium at 732-872-1300 ext 10. New Jersey Sea Grant Consortium staff ventured to Pennsylvania Coast Day. Dr. Michael Schwebel, NJSGC/Urban Coast Institute community resilience and climate adaptation specialist, taught visitors about resilience. Visitors utilized shells and other items to protect models of communities against storms in a wave tank. Dr. Peter Rowe, NJSGC’s director of research and extension, taught visitors about an extremely important species, the horseshoe crab. Visitors used a wave tank and learned about horseshoe crabs. Photos by Michael Schwebel. How do Americans feel about climate change? A new infographic created by New Jersey Sea Grant Consortium and Monmouth University’s Urban Coast Institute visualizes the beliefs of Americans on this key topic. Using data collected in a December 2015 Monmouth University poll, Dr. Michael Schwebel, community resilience and climate adaptation specialist for New Jersey Sea Grant Consortium and Urban Coast Institute, developed this infographic to bring the data to life. According to the poll, 7 in 10 Americans believe that the world’s climate is undergoing a change leading to more extreme weather patterns and sea level rise. A majority of participants were convinced that climate change would impact both coastal and inland communities but had differing opinions on the extent of the human impact of climate change. 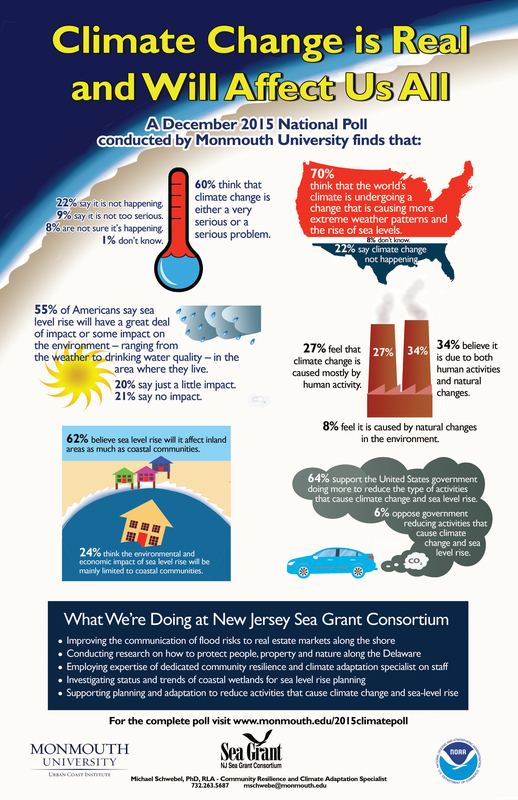 The infographic also provides information on how New Jersey Sea Grant Consortium is working to better understand and communicate the impacts of climate change in coastal and inland communities. The infographic, which was adapted from a template provided by Delaware Sea Grant, can be viewed and downloaded at njseagrant.org/climateinfograph. To view the complete poll, visit www.monmouth.edu/2015climatepoll. If you are interested in a receiving hard copies of the poster, please contact Dr. Michael Schwebel at mschwebe@monmouth.edu. Click here to download the PDF or the high resolution version here. Take a spin at the Climate Hazards Game with Dr. Michael Schwebel on June 5. Learn firsthand about the decision processes that emergency planners and public officials now face. Schwebel, Community Resilience and Climate Adaptation Specialist at the New Jersey Sea Grant Consortium and Monmouth University’s Urban Coast Institute, developed the game as a way to educate audiences of all ages about pressing threats coastal communities face and steps that can be taken to deal with them. Players spin wheels that show the likelihood of various coastal hazards taking place and are challenged to allocate a limited amount of funding to deal with each of them. Dr. Schwebel’s presentation will take place on June 5 from 12:30 p.m. to 1:30 p.m at the Eatontown Community Center at 58 Broad Street, Eatontown, N.J.
Take this opportunity to learn the basics about climate change and coastal resiliency and answer the question of the difference between weather and climate. You will also learn what it means to choose eco or ego solutions. No reservations are needed and the event is recommended for ages 10 and up. Light refreshments will be served. The event is sponsored by the Eatontown Environmental Commission. For more information, email EEC@yahoo.com or call Sara at 732-890-6772. The 2016 Fish and Wildlife marine recreational fishing regulation cards are in. The cards are provided free of charge by New Jersey Sea Grant Consortium, New Jersey Department of Environmental Protection, New Jersey Division of Fish and Wildlife, and the National Oceanic and Atmospheric Administration. The cards provide information on the correct minimum size, possession limits and season of catch. The laminated cards are convenient to bring on any fishing outing, complete with built-in ruler measure your catch and make sure they are above the minimum size. Cards are distributed to the public by New Jersey Sea Grant Consortium. Fish are measured from tip of snout to tip of tail, with the exception of black sea bass and sharks. No species of fish with a minimum size limits listed on the card can be filleted or cleaned at sea. The cards also serve as a reminder to register to fish. It is free and can be done at SaltwaterRegistry.nj.gov. For more information on what catch is safe to eat, visit FishSmartEatSmartNJ.org. Visit NJFishandWildlife.com or njseagrant.org for more resources. 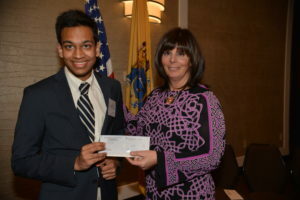 New Jersey Sea Grant Consortium presented awards to two students at the 54th Annual Monmouth Junior Science Symposium. 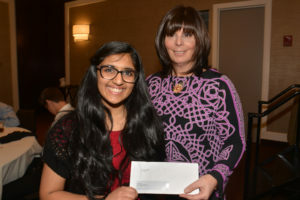 The symposium took place March 17 and 18 at Monmouth University with the goal to promote research and experimentation in the sciences, engineering and mathematics at the high school level. Another important component is to recognize these students for outstanding achievement. 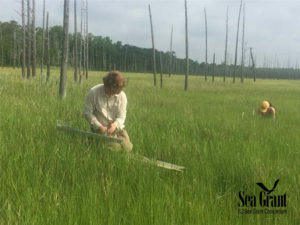 New Jersey Sea Grant Consortium has announced its latest round of Sea Grant-funded research projects. Projects were selected from dozens of proposals received in response to a request for proposals (RFP) issued by NJSGC in December 2014. The RFP specified research priorities that were determined through a collaborative process that received input from stakeholders, NJSGC’s advisory boards and partners, and the public. The final projects were selected based on relevancy and scientific rigor using a competitive, peer-reviewed process. As a result, funded projects reflect local concerns and seek solutions to New Jersey’s most pressing marine and coastal issues. The current cycle covers a wide range of topics from communicating about flood risk to new species development for New Jersey’s shellfish farmers. While these projects span a variety of topics, they all contribute towards NJSGC’s mission to provide sound scientific data to promote wise decision-making about New Jersey’s coastal and marine resources. Projects are funded in part through a grant from NOAA/National Sea Grant which NJSGC has successfully managed in the state of New Jersey since 1976. NJSGC’s next research RFP will be issued in December 2016. Descriptions of each project can be found at njseagrant.org/research/research-projects.